Gerry McGinnis is one of the most talented custom knifemakers in the industry today and has been for quite some time. He's among the youngest designers ever to be featured by CRKT and his designs keep getting better. This Pro Line Mini Exo is absolutely amazing. It's machined using the same processes as his customs, assembled by hand the same way with the same attention to detail as Gerry puts into his customs. He has 100% control over how these knives come out because they (Gerry and his father) are doing everything but the blade grinding right there in their own shop. It's a superb EDC knife that really gets everything right. The detent is very strong which makes the flipper work extremely well. The blade fires out like an AUTO knife and really locks up solidly. The blade is deeply stonewashed with a high flat grind and plenty of belly. It rides on caged bearings in a formed race in the handles, requiring no pivot adjustment. 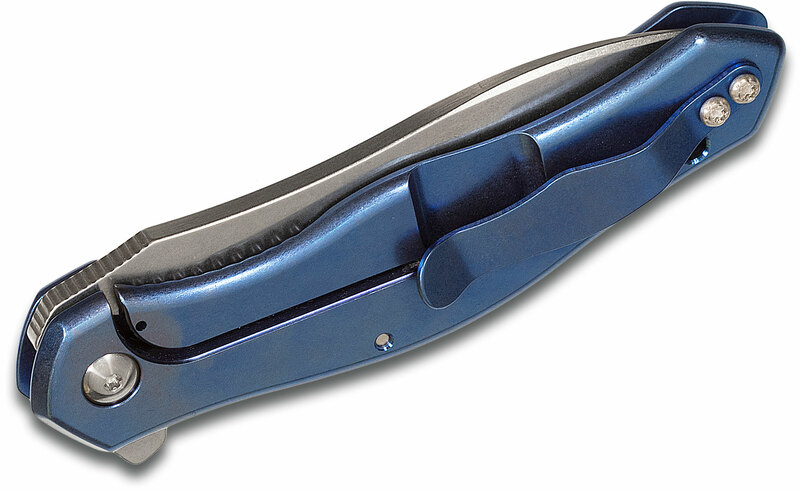 The handle is durable titanium with a blue anodized finish and machined holes to reduce weight and add traction for your fingers. It's ergonomically curved and slim which makes it very comfortable to hold and easy to carry. It's simply beautiful from the way it looks to the way it functions and everything in-between. There isn't a negative thing we can say about this knife. It features great jimping on the thumb ramp, a G10 back spacer, anodized titanium pocket clip, lanyard hole, Torx screw construction throughout, and has one of the sharpest edges we've ever seen. It is truly a fantastic knife for your collection or everyday carry rotation. The only thing you will need to do to your knife upon delivery is clip it in your pocket and carry it. The pivot needs NO ADJUSTMENT. I spend a lot of time tuning each knife and adjusting it won't make anything magical happen. If the stop pin track gets dirty, blow the knife out with compressed air. If you must take it all the way apart, the clip side screw is the screw to take out of the pivot. Be sure to clean and re-grease the bearings with Sentry Solutions Hi-Slip Grease or equivalent. When in doubt, don't take it apart, especially for no reason. Hey, I wanted to share "Gerry McGinnis Pro Line Mini Exo Flipper 3.25 inch Stonewashed CPM-154 Blade, Blue Titanium Handles with Three Machined Holes" with you from KnifeCenter.